I had the wonderful pleasure of visiting a friend on a lake. She had a paddleboat that came with two great incentives: the view and a Starbucks on an opposite shore. A lot of time was spent on the paddleboat and one of the lake photos yielded this sunset view. This pastel was a delight to do. 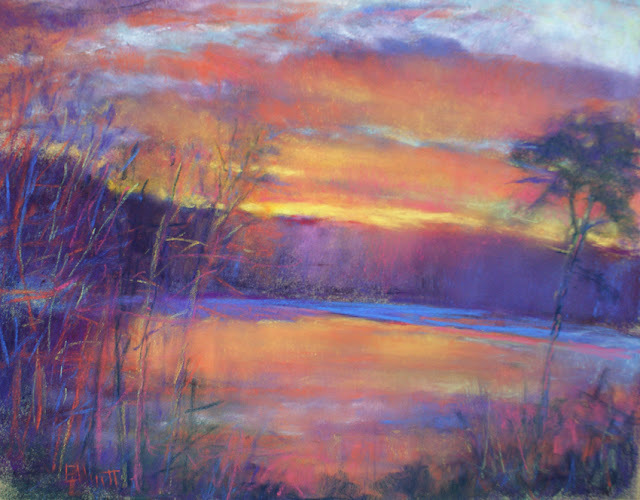 My intention was to keep it really simple and the center of the pastel reflects just that. OK, so I added a bit more detail to the clouds but then it changed everything. Now the edges of the scene called out for more detail as well. Adding foliage to the sides was very helpful but the center as it was originally done was now lacking something. If you change a thing in one place then it often requires adjustments elsewhere. I realized I had the perfect opening in the center part of the view to heap more color on the band of trees. I put in a variety of colors as an atmospheric glow... that worked out nicely. With just a few additional moves, it all came to life in a way I never imagined.